CARMEL, Calif. – July 20, 2018 – Klaus Wagger, an award-winning painter and member of the Automotive Fine Arts Society (AFAS), puts the viewer at Monaco’s hairpin via his original artwork at the group’s exhibit and reception during the Pebble Beach Concours d’Elegance on Sunday, August 26th in Carmel, California. This is the 21st year that Lincoln Motor Company will sponsor the AFAS exhibit on the Pebble Beach show field. As Mr. Wagger describes the scene, “It is the Monaco Grand Prix of 1933. In this classic Depression-era contest, the race was defined by an epic duel between Italy’s Tazio Nuvolari, driving an Alfa Romeo 8C Monza, and Achille Varzi aboard Ettore Bugatti’s T51.” If not the end of the classic GP era, it would be the beginning of the end. By the mid-30’s the industrial might of Germany, behind the badges of Auto-Union and Mercedes-Benz, would be on the Grand Prix grids and, inevitably, taking the checkered flags. The fight – and flight – between Nuvolari and Varzi lasted 99 laps, until the Alfa’s engine finally blew in the penultimate lap, handing Varzi’s Bugatti the victory. The combat is depicted by Wagger at the Station hairpin, named after the old Monaco railway station in the background. 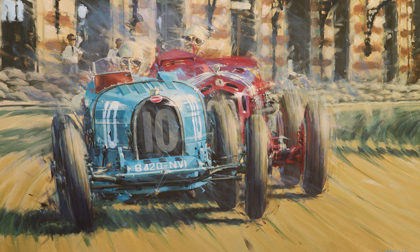 With both Alfa Romeo and Bugatti staging a return to U.S. showrooms, Mr. Wagger’s acrylic on canvas depiction, measuring roughly 55 X 40 inches, would easily underscore the enthusiasm of any Alfa or Bugatti owner. Growing up in the Austrian Tirol, Klaus Wagger was surrounded by an aggressively active – albeit aggressively agrarian – motorsport scene. And motorsport’s influence continues to boost the ‘octane’ of his automotive art today. From drawing cars in school books, Klaus graduated with a degree in Industrial Design. With an established freelance career in both design and technical illustration, Wagger entered a competition to design a poster for the Mille Miglia in 2000. With his study of a Mercedes SSK in flight, Klaus took first prize. Subsequently, Wagger’s work has been featured several times in the promotion of prestigious Italian events. It was, however, at Retromobile in Paris when his career in automotive art took off. Motoring art has always been a fixture of this iconic French show, and in 2004 it was Klaus’ bold style and vibrant brushwork that became the talk of the Retromobile community. By Klaus’ own admission, realistic backgrounds are of no interest; Wagger prefers “to employ bold abstract tones capturing the drama of the car, the noise and the speed.” Klaus puts the background colors in quickly to set the mood, and then allows the painting to develop. Surprises – and there are many – come standard. While Retromobile remains the mainstay of his exhibition schedule, Wagger also regularly exhibits his art at the Goodwood Revival, Festival of Speed, Silverstone Classic and Techno Classica.